Medical aid brokers play an important role when you are looking for the most appropriate medical plan. South Africans are spoiled for choice when it comes to the variety of different health care plans that are available. This very large number of options makes it a daunting task to choose the best possible medical cover. However, this is where the services of medical aid brokers can be invaluable. It is true that South Africa has a large and well-organized public health service. It is unfortunately also true that the public service is overloaded and underfunded. Patients often have to wait a long time to undergo procedures. And in most cases it is not possible to make fixed appointments. Comprehensive plans are more expensive but they offer cover for a wide variety of conditions, including the services of dentists and optometrists. There is cover for day-to-day medical expenses as well as in-hospital treatments. Hospital plans cater for hospitalization only. These plans are more economical but they do not cover day-to-day medical expenses. 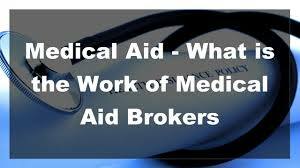 Why use medical aid brokers? Most brokers are independent. They don’t punt any specific medical scheme and they are therefore able to provide their clients with objective advice. What’s more, they specialize in health care systems and they therefore understand the terms and conditions that are part of every plan. There is a bewildering array of plans available and very few laymen are able to compare medical aids sensibly. In fact, many plans seem to be identical and it can be very difficult to make select a plan that will cater for the specific needs of a family. A broker can help families to assess their own needs realistically and to choose a plan that is affordable and appropriate. The services of a broker can be invaluable when it becomes necessary to deal with the scheme to obtain permission for procedures and specific treatments. The broker also acts as go-between when there are complaints or conflict between the scheme and the member. A broker can help families to ensure that they are properly covered at all times. As circumstances change, the nature of the cover should also be re-evaluated. The broker can help clients to upgrade or downgrade their medical cover as it becomes necessary. There is no doubt that a broker can help people choose the best medical cover but it is also important to choose the right broker! It is better to approach a professional that is in no way associated with a specific scheme. The broker needs to be independent and objective. It is vital to ensure that the broker is a registered member of the Council for Medical Schemes. This is required by law and clients should not feel embarrassed to ask for proof of registration. Reputable brokers should enjoy a good reputation with the various schemes that they deal with. Clients should ask the broker which schemes he uses. If it is only one or two, it may be better to opt for another broker that is able to present his clients with more options.